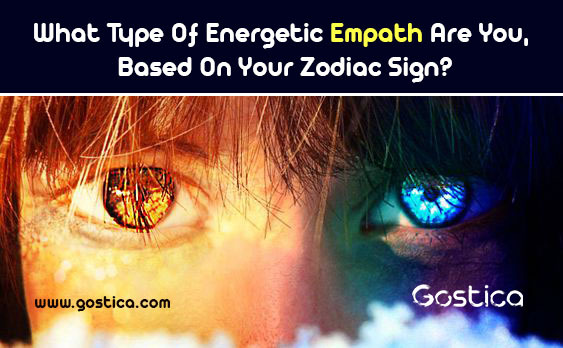 What Type Of Energetic Empath Are You, Based On Your Zodiac Sign? We are surrounded by energy vibes whether we see them or not. These vibes affect us all. They change us with every breath we take. Some of us, are more keen on realizing these subtle changes as they can actually sense them. But here’s the tricky part. All empaths are not the same. Hence, there are Types of Empaths. The ones who can actually feel the pain, hear the pain, or maybe since the what troubles the animals, or the trees etc. Zodiac Signs have actually a very good story to tell for each of us revealing the magical potential behind our physical talents. Remember, being an empath is the first step. Practicing on our ability to ‘sense’ the energies can bring us to the second step. Aries is the force of Spring. Energy in them runs in a very peculiar way, as when the Sun enters their Zodiac Sign, all species urge to win the battle against Winter. This brings all Aries close to animals who somehow can connect with them better than other signs. Aries may want to hunt or go fishing but that’s just another way for them to become one with the Circle of Life. When the Sun enters Taurus things become real and everything is materialized. Hence, Taurus feelings become so strong that can actually be manifested. Taurus is this type of empaths who actually mirror emotions into their own bodies. These ‘psychosomatic’ symptoms are extremely common to them. Many of their health issues are just another actual form of empathy. Gemini is an extremely sensitive individual who can actually attune to voices and vibes from all around them. This makes them telepathic empaths who can easily enhance this ability to both receive and send messages to anyone they like. The key is to feel free and doesn’t try to judge what you are thinking. Let the thoughts travel free. Telepathy is a rare gift and a powerful weapon. Use it wisely. Cancer is the most sensitive individual and the purest type of Empath. We could title Cancer as the “Pure Empath” or “True Empath” as you guys have a natural ability to feel the ripple any emotion causes. It comes naturally to you. Moreover, this changes you. Have you noticed how different you react when you change rooms where other people are? You mirror everyone’s thoughts and emotions in your psyche and this changes you like the waters follow the tides. It is amazing how much you can feel when you touch something which belongs to someone else. The key is to let yourself free and let the emotions fill you. Any item has a story and you can actually tell it. This is exactly why when you wear or hold something which is not yours, it gradually affects your mood. Have you noticed? This is a psychometric ability is unique among the types of empaths. Amongst all Types of Empaths, you are the one who can literally affect or be affected by flowers, plants, and trees around you. It is no secret that all astrologers advice Virgo to plant healing herbs in their houses. Lavender, Mint, and Rosemary are Virgo’s best friends and generally, all Botanics are somehow close to your psyche. When you learn to attune with the forces of Trees you can become unstoppable. Have you ever wondered why Libra is genuinely indecisive? Libra can actually feel emotions of nearby people which ultimately affects their judgment. Their mood swings are caused by this amazing ability. When they learn to tell the difference between the emotions which belong to them and the ones which do not, they can become extremely powerful. You already knew that don’t you. From all the types of Empaths, it’s you who can naturally sense the spirits and other invisible entities around you. It’s no wonder why Scorpio is considered the best conjurer. Moreover, you can affect them by becoming a beacon of light for them. Furthermore, you are able to get valuable information from the spirits. The key to this amazing ability is to feel safe and secure. Always looking for what is the meaning of life, Sagittarius has an amazing ability to empathically sense the truth inside of us. Don’t lie to Sagittarius. They value honesty and straight-forwardness. Moreover, they can instantly turn their backs to one who has betrayed their trust long before the truth comes out. They are able to travel the World to get taught by teachers who speak of the truth of the World. We are parts of Earth and as their children, some of us, have an amazing ability to ‘sense’ what’s troubling mother nature. Moreover, Capricorn has a unique skill, to sense the geomantic waves which flow underneath. Thus, Geomantic Empaths can instinctively sense what’s wrong or right with a place, instantly liking it or not. Their ability, if developed properly, can give amazing and fruitful results. Capricorns can act as natural feng shui detectors, sensing the energies around their place of living and of coursework! Aquarius is born to connect with everything and everyone around them. Thus making them instantly very powerful empaths. For what is worth, Aquarius should be named the Gaia Empath. Why? Because they can sense if Gaia – our Mother Earth – is full of energy or sick. Aquarius not only can feel emotions of nearby people, but they can sense feelings of whole regions if not continents. Recommended: How being an Empath can lead to Adrenal Fatigue, Insomnia & Exhaustion. Furthermore, this Cyber-empath skill is a unique ability they can grow further into deliberately scanning countries and regions for feelings. Amongst all types of Empaths, these guys have the unique ability to sense what is going on in different planes. Moreover, Pisces can easily sense (and later, if developed properly interact with) the ‘Astral Plane’. Why is that important? Because they can actually feel emotions before even others realize they have. In the Astral Plane, things exist prior to our Material Plane. Sensing the Astral Plane can help Pisces avoid toxic people.